Why are there buy and sell limits on Trakinvest? There’s a good reason for this. Trakinvest has set limits on the amount of shares you can buy or sell of any stock to keep the game realistic and make sure all players are competing against each other fairly. These limits are based upon the weekly average traded volume of a stock. If you were to buy a very large volume of shares – say 5% of a company’s outstanding shares – you’d almost certainly affect the market price of the stock. In this case, the price would go up to reflect a perceived increase in demand. While this situation is probably highly unlikely in real life (a retail investor buying such a large quantity), it becomes easily achievable on Trakinvest. US$100,000 in virtual cash can go a long way in some markets. Already held shares in your portfolio count. 1. 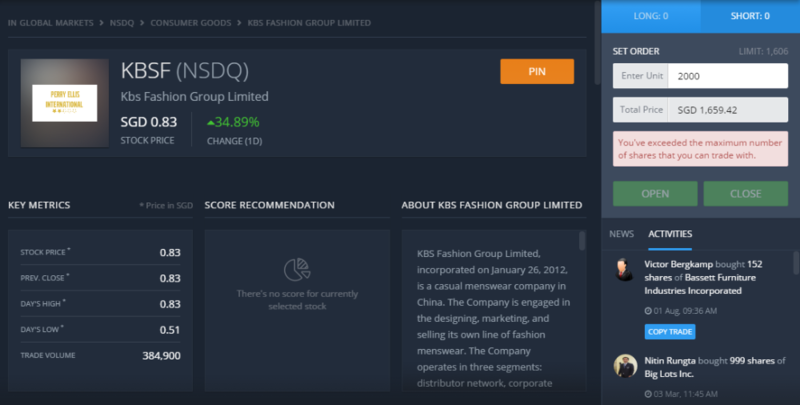 Jimmy opened a short position of 100 shares of NASDAQ listed KBS Fashion Group Limited at SG$0.51 per share. There is a trade limit of 1,606 shares on this stock. 2. Later that day, the price went up to to SG$0.83 per share and Jimmy decides he wants to open another short position of 2000 more shares. 3. If Jimmy opened a short position of 2000 more shares his balance would be 2100 shares – beyond the current trade limit of 1,606. He sees an error message, because the most he can currently buy is 1,606 shares. Similarly, the platform will tell you the buy and sell limits for when you are 'Long' on a stock. Be aware that limits change, and can increase or decrease. Limits are regularly reviewed and updated every week as volumes traded change. In some instances, this could mean that you’re unable to sell all of your currently held shares. You might choose to sell what you can, and based on your knowledge of the stock, prepare to sell more once the trade volumes of the stock increase and limits are relaxed. Or you might decide to hold onto the stock in the belief that the price is going to shift favourably. Whatever you do, when it comes to these kinds of stocks, it pays to know what you’re buying into in the first place. Low traded volume stocks while potentially being lucrative are likely to be more restrictive when it comes to trade limits. In summary, as trading on Trakinvest is virtual and orders don’t have an effect on market prices, buying a large number of outstanding shares in a small cap stock could result in unrealistically big profits for a player when there’s even a small increase in share price. Obviously that’s not realistic or fair for anyone playing, and that’s why we designed the system this way.